So, for the record – I’m not trying to reinvent the wheel here. I don’t propose to be Neil Perry or Kylie Kwong. What I am endeavouring to do is give food inspiration to busy and tired people. Healthy, tasty, quick. That’s the key. Let me preface this recipe by saying I love pesto. I don’t love it because it’s versatile, and can be stirred through mayo to dress a salad or smear on a sandwich, and I don’t love it because it keeps nicely when refrigerated or frozen. I love it because D Man loves it and it takes 5 minutes to prepare. 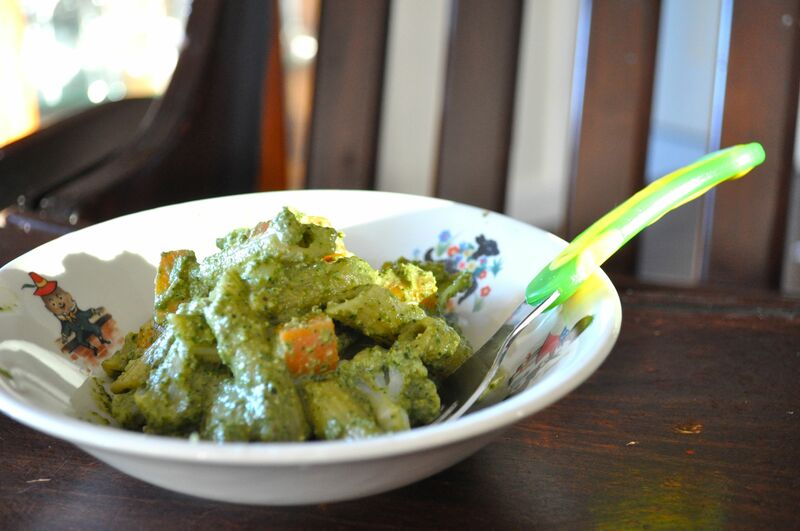 By the time the water for the pasta has boiled my pesto is ready and we’re good to dine, in a messy green fashion. This can be dolloped onto grilled fish or chicken, or stirred through freshly boiled potatoes with a squeeze of lemon. Basically, take what’s in the fridge and fancy it up with green stuff. Works on kids and husbands. 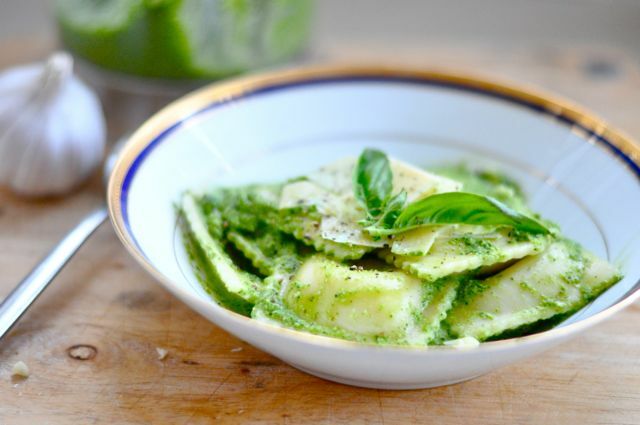 Traditionally, pesto is basil with a few other bits thrown in for excitement, but I’ve discovered that with enough basil and parmesan you can disguise most green vegetables so it’s a brilliant way to get in some sneaky veg. 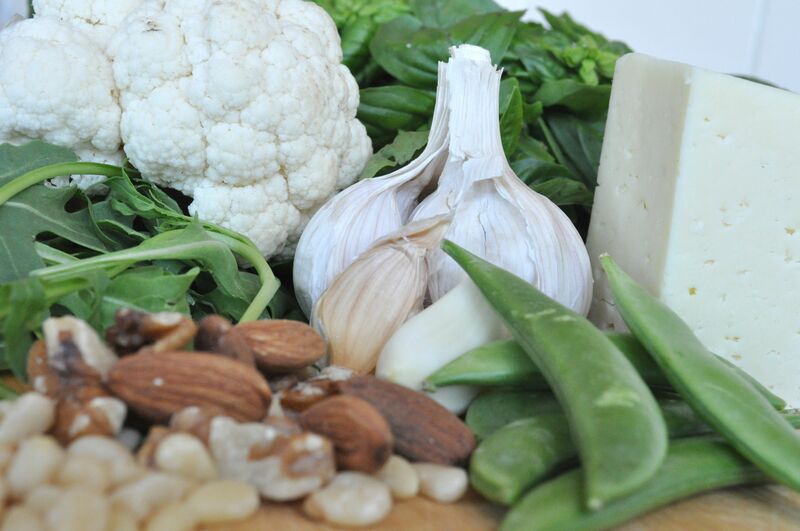 Raw food is incredibly important for the human body so I often don’t bother cooking what I blitz, although if you wanted to blanch quickly, that works too. If you’re all freaky on wheat there are many alternatives available at the supermarket these days – quinoa, rice and corn is a great combo that has fabulous nutritional qualities. D Man can spot it, however, at 20 paces and gives me the Mafioso stare down if I try to feed it to him…..that said, I can do a sneaky half and half if he’s not watching. Cooking times are different though so beware of the crunchy penne dilemma and be sure to read cooking instructions. Now, I’m writing this as a toddler meal, but on busy weeknights I’ve most certainly been known to buy some good quality spinach and ricotta ravioli and crisp up some pancetta and serve this to us tall people for dinner. It’s seriously so fast and easy….and most importantly, yummy. NOTE : If basil is too expensive or strong tasting for your bub, you can substitute parsley. The added bonus of this is a monster iron hit, too. Place all ingredients into a mini food processor, or blender or container to blitz with hand held Kitchen Wizz thing. Basically, smoosh it all together until it forms a paste. You want it to be luscious, not gluggy so add a little water, if needed, until it’s like a thick sauce. Meanwhile, boil your pasta. At the last minute I also throw into my pasta water some cubed carrots and cauliflower as this gets devoured when green. Drain pasta, add a couple of spoons of pesto and serve. You can also add tinned tuna, cooked chicken, cherry tomatoes or whatever you have for variety on the theme. 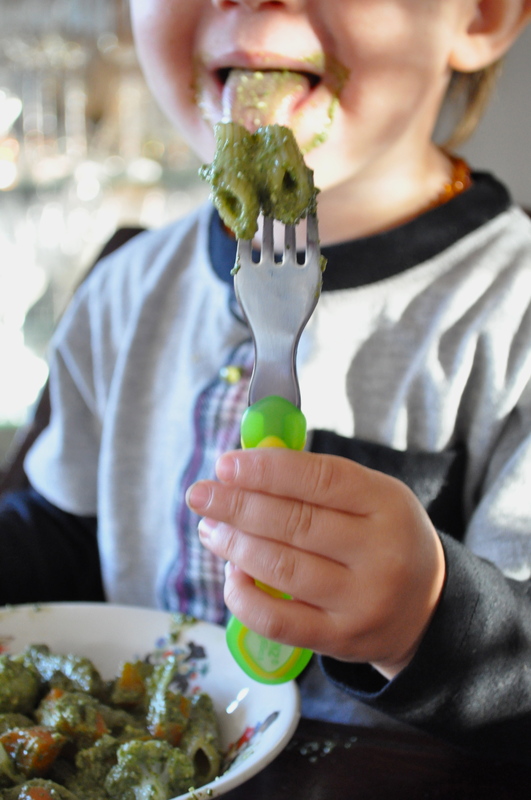 Just looking through your Toddler Food archives while my bub naps and whipped up this pesto sauce for her lunch later today. I threw in a half a zucchini (for some reason I would never have thought to include vegies in a pesto sauce). Tastes delicious, but doesn’t look as smooth as the sauce in your photos…perhaps it’s my food processor?? Thanks for sharing. Maybe add a touch of water and keep blitzing? That’s what I would do. Nice and smooth helps it slide into the penne and gets more sneaky veges into little mouths!! !